From Concept to Creation we can build your outdoor dream! The premier DESIGN, BUILD & INSTALL specialist for extending your home's living space into your outdoor environment with custom culinary spaces designed to enhance your entertaining lifestyle. We pride ourselves on creating unique, natural looking water features. Water features are one of the best ways to really make your landscape stand out and bring traquility to your backyard. Show off the color and texture of the landscape at night. 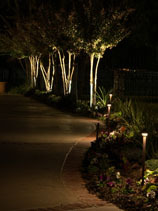 A properly designed outdoor lighting system can bring function, security and beauty to your outdoor space.